Ask fellow campers about "Pioneer RV Park" and nearby attractions. A Good Sam Park, it is has been around for awhile. It is large with flat spots and big rig friendly. Not shaded. It has full hook-ups with 30 amp power that works. There is a store, wash rack, mechanic, fuel pumps (gas and diesel), laundry, showers and washrooms. The staff is friendly. We stayed 3 nights as part of a caravan. We camped at Pioneer RV Park in a Motorhome. Typical gravel parking lot but room to move around. Level. Good Sam Discount. Cable TV. Free Wi-Fi but didn't work for us. Good for overnight or maybe 2 if you want to check out Whitehorse. We have stayed before and would stay again. We camped at Pioneer RV Park in a Motorhome. This is a Good Sam park. We stayed here in both June and August. We elected to stay in their dry camping section for a very reduced price. It is located up the hill by the water fill and dump station where they store RVs and some old buses. It was very quiet and definitely not crowded. We had lots of space to set up and we were able to use our rooftop satellite. We did not use the bathhouse or laundry and the wifi is not free so we also did not use that. There is a Wal-Mart in Whitehorse but it is not a super store and sells a limited selection of groceries. The parking lot is a zoo because many RVers stay there. All in all, it was not a bad experience and we would stay there again. At least we were not jammed up next to other RVs like those in the hook up section. We camped at Pioneer RV Park in a Fifth Wheel. Friendly staff. Campground has discounted fuel and propane. Very tight sites. I'd definitely stay again when in the area. We camped at Pioneer RV Park in a Fifth Wheel. This park is okay as a pass through. Definitely not a destination. Rigs crowded in side by side. Hardly enough room to turn around. Nothing more than a parking lot with hook ups. Laundry suitable - 2.50 a wash, 2.00 to get dry enough. If we ever came back to this area, would look for another park. We camped at Pioneer RV Park in a Fifth Wheel. Power was very sporadic. Got below 104 volts on two occasions and over 138 on another. Good thing I had a surge protector. Sites are very crowded and narrow. Wi-Fi was free, but limited to 300 MB per day. 3-cent discount on all fuel at their pumps. We camped at Pioneer RV Park in a Motorhome. Nice owners/operators, helpful with local knowledge. Easy in/out pull-through sites. WiFi worked well limited to 300 mb per day per RV. Coin operated RV/car wash worked well. Convenient to Whitehorse and surrounding area. Diesel fuel price was as good or better than anyone else in the area. They offer .03 discount per gallon of gas or diesel. If you're headed north on the Alaska Hwy you'd do well to fill up here. We'd definitely return passing through this area. We camped at Pioneer RV Park in a Motorhome. Nice park with fuel pumps that they give you a discount on. Propane also available. Some sites are on a gravel parking lot type area but we stayed up on the treed area up a hill at the back of the park. We would stay here again. Staff was helpful. Price reflects a Good Sam discount. We camped at Pioneer RV Park in a Motorhome. Easy pull through sites accommodate towed without unhooking. $.03 per liter fuel price reduction. RV power wash area (1 loonie for 3 minutes) and oil change area. Convenient hookup locations. Stable 120 VAC power and good water. Didn't use cable TV so don't know about that. Office staff very friendly and helpful. They will book tours for you and arrange for tour bus to pick you up at the park. Level gravel spots that do not get muddy when it rains. Wi-Fi very good in #61, where we parked. You are limited to 250mb of data per 24 hours but if you ask and they are not full they will give you more. We will stay here again. We camped at Pioneer RV Park in a Motorhome. Large gravel lot, friendly staff. Large laundry room, but some of the dryers are broken. Great Wi-Fi, good cable TV. We camped at Pioneer RV Park in a Fifth Wheel. We stayed at this park because our first choice was full. This turned out to be a pretty nice place - as long as you don't stay in one of the "parking lot" sites near the office. The upper sites don't have sewer, but they do have water, electric and cable TV. They're nice treed sites that are much prettier than the more expensive pull-thrus. We have a 40-ft RV and had no problems pulling in to our site. Wi-Fi works well (although they limit your use to 250 mb per day, so don't try to download or upload pix, etc.) Still, a nice place and better than many on the Alaska Highway. For $30 (with Good Sam discount) it's a deal. We camped at Pioneer RV Park in a Motorhome. Typical gravel parking lot we have seen through BC and the Yukon. Hook ups worked OK. Wi-Fi was a bit weak. CG is right on the road but separated by a row of trees. Noise isn't too bad. Didn't check out the no hook up sites on the hill. Vehicle wash was a $1 for 3 minutes wash time. That is about the usual rate we have seen. 3 cent/Liter discount on fuel at the park for staying in the park. Easy in/out. Would use it again. This worked out OK. Whitehorse is kind of a neat little town. Worth a full day if you are into history. Visitor Center is very nice. Would stay here again. We camped at Pioneer RV Park in a Motorhome. We booked this campground on the pictures of the sites and all of the features it boasted. The pictures are of the sites with no services up on the hill. All of the serviced sites are in a huge parking lot on the bottom of the hill. Units are parked tightly together. It was horrible. Our reservations were for 4 units, and everyone was scattered. They catered to the caravans. Reservations for Skagway tour were not made...make them yourselves. They said they would dog sit my dog while I did the tour, but that only means to leave your dog in the camper, and they will come let it out, IF they get the chance. When promised services were not honored; they just said "stay somewhere else". Would never recommend. We camped at Pioneer RV Park in a Travel Trailer. Great overnighter for our 43' four slides and tow. Tight with your neighbors but level, electric works all the time, water and sewer, Wi-Fi is 250 mb free and works fine, nice gravel sites and little dust. Not private, but no scratches from overhanging trees or shrubs and easy in and out. A little noise from the road but we slept fine. Friendly staff and reasonably close to town. We camped at Pioneer RV Park in a Motorhome. This park is a hole cut out of the earth where they pack in as many RV's as possible. The electric is very poor. The park was full & we were at the end of the line. We lost power completely the second night we were there. The morning of the 3rd day the power fluctuated so badly that it kept tripping our Progressive surge protector. We had to disconnect from the power to keep from frying our electronics. The good things about the park are it is close to town. The laundry room is very clean & very large. It has a very good RV/car wash that was in great demand while we were there. It also has fuel at a discount for park guests. We were also able to get a satellite signal. We did not stay here on our way back home because of the power issues but I would probably stay here when the park was not so full. We camped at Pioneer RV Park in a Motorhome. The lower campground is packed, tight. There is fuel and propane available in the park. They also have an RV and tow vehicle wash station. 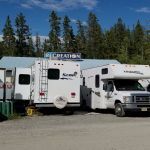 Yukon Wildlife Preserve & Game Farm, World's Largest Weather Vane, Yukon Transportation Museum, S.S. Klondike and the Whitehorse Dam and Fish Ladder plus more we didn't have time for. There is a WalMart, Canadian Tire, Canadian Superstore and Savon Foods in town. Downtown Whitehorse is very busy during the week, lots of traffic and construction. Get a free visitor's parking pass at the visitor's center to avoid having to feed the meter constantly. 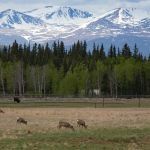 Yukon Wildlife Preserve - allocate 2-3 hours plus drive time. Takhini Hot Springs - a dated facility, but good to soak after walking 3 hrs at the Preserve. City of Whitehorse - one or 2 days to explore. They offer numerous sightseeing experiences and the buses stop at the office to pick you up. They offer $.03 per litre discount on fuel. Best tip here is that customers of the park receive a 3 cents per liter discount on fuel. That makes fuel here the cheapest in all of Whitehorse. Easy pump access at entry to park. Stay elsewhere - not even enough room for a table. The roads are navigable but the signage for one-way could be more visible as we made a wrong turn and ended up going in the wrong direction simply because we did not "see" the arrow. Buy gas here if staying here! Book ahead in summer! After traveling through construction our truck was horrible. They have a great RV wash. Provided tours into town and the Skagway Railway were full buses. Must have been a popular attraction. We did not use them. Sanchez Cantina at Hanson and Third in Whitehorse has EXCELLENT Mexican food! 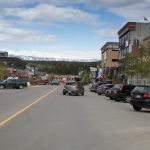 There are numerous tourist traps in and around Whitehorse - they are all worth a visit. Restaurants are OK but we found nothing exceptional. The highlight of Whitehorse for us was the tour of the Yukon Brewery. Bring a growler or buy one of theirs - the beer is delicious. Lots to see in Whitehorse, we visited the Yukon Brewery. Overall the best tasting selection of beer during our 5 month trip. Whitehorse transportation museum was interesting, checkout the weather vane. several good places to eat in Whitehorse, like Giorgio's Cuccina & Burnt Toast. Also Yukon Brewing is here ! Are you affiliated with Pioneer RV Park ?